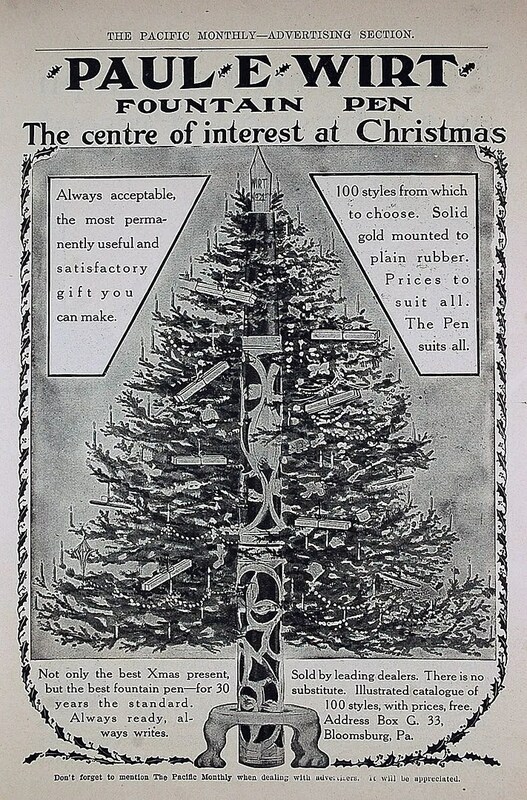 A Merry Christmas Season from Fountain Pen Restoration! 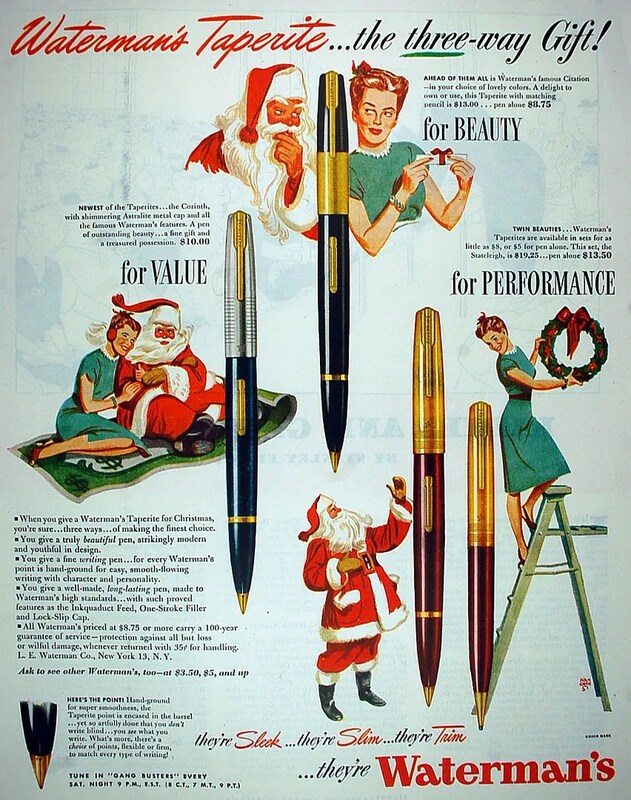 I found this 1946 advertisement for some Waterman mid-1940s Taperites and thought it was a good way to pass on some early Holiday Cheer, and restore a pen that has been in my queue for several weeks – a Waterman Citation (the middle pen in the advertisement below – priced at $8.75 in 1946). Having always before concentrated on early Waterman’s, I became attracted to the clean art-deco look of the Crusader. Recently, I had an opportunity to purchase a used Citation that needed restoration and I jumped at the opportunity. You can see the pen below, after I took it apart. There are two main problems with restoring these 1940s pens. First, the sections are often very tightly attached at manufacture and separating them from the barrel can be problematic. Secondly, if you do get the section apart, the nib and feed are extremely difficult to knock out. The plastic is quite easy to crack and the nib is hooded and has to be removed in a reverse direction. As you can see below, I was successful in removing the section, but there is no reason to tempt fate and I cleaned the nib and feed by running the entire unit through an ultrasonic cleaner for about 120 seconds. The barrel and cap needed to be cleaned up, so I applied scratch remover, polish, and wax to each. the finished result, after I attached a size 16 sac is below. The pen measures 5 5/16 inches closed and 6 1/8 inches posted. Citations were produced in 1945 and after. The advertisement above is from 1946, and highlights a few other early Taperite models – the Stateleigh and the Corinth. The Crusader below, was not produced until about 1948 and after. Both have clips that I think are really cool, and though not particularly strong, are visually appealing.